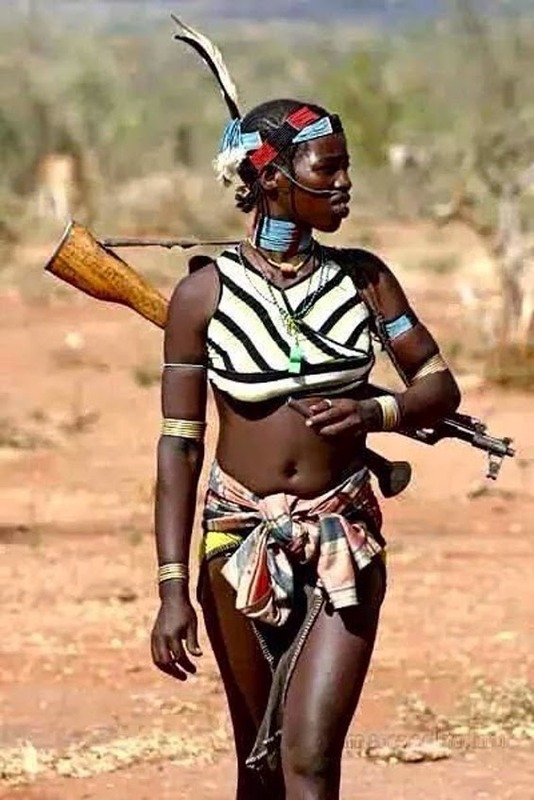 I am just saying that when you look a little deeper into this picture, a beautiful African Warrior who is carrying a weapon made by the enemies of all Africans. When she needs more ammunition or another rifle she has to go to the ones who manufacture these weapons, and they are most likely, as I am sure they are, of European or Asian Descent. And as we know these are the same people who have invaded and colonized the African peoples for way too long. Europeans through the gun, bible, disease and intimidation, and Asians through the slow subliminal take over of their natural resources and infrastructure. Look at any picture of Africans fighting against other Africans. Where are their weapons manufactured? That is the question that comes to mind when I see this picture. Besides the beauty, I see behind it, the destruction of African civilizations down through the ages. The difference here is that she is not wearing Army fatigues, or a bullet proof vest or any other such armor to protect her from an incoming or errant bullet from another’s rifle. Hopefully, she is on her way to hunt some food for her family and not on her way to kill another African! !